It’s impossible to ascertain the significance of the gr. 1 Travers Stakes on a national basis because here everything about it has been blown out of proportion. The race is, after all, the showpiece of a meet that knows no comparison. More women wore fancy hats to the track on Travers Day than on “Hat’s Off to Saratoga” Day. Picnickers plunked down their folding chairs in spots that had not seen shade the entire summer. Rod Sutton ordered that $10 spots be sold for $25 in his parking lots. Now that it’s over, people will say that Stay Thirsty, by winning, ascended to the top of the three-year-old division. That’s probable, but not certain if records mean anything. Ten different horses have won the ten different Grade 1 Stakes for three-year-old colts, he being the latest. Regardless, the Bernardini colt’s most recent races – a nose loss in the 1-1/2 mile Belmont, a Jim Dandy Jim Dandy and the Midsummer Derby – are as fine a streak as any three-year-old horse has put together. 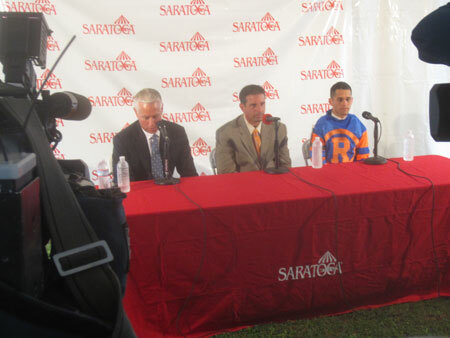 Three questions into the post-Travers press conference came the query on everyone’s mind – “How do you feel about Uncle Mo’s loss?” Stay Thirsty’s owner Mike Repole doesn’t strike many people as a guy who does a lot of thinking before he answers. Yet, if he’s serious about retiring his Travers star’s more celebrated stablemate, it wouldn’t come as a surprise to anyone. When horses don’t win as expected, their breeding value slips. The even-money Uncle Mo lost the gr. 1 King’s Bishop Stakes by a nose to Caleb’s Posse. The two-year-old champion appeared destined for the winner’s circle until Rajiv Maragh urged his mount one additional frantic stride to overtake him. The photo of Maragh looking left at Uncle Mo as he passed John Velazquez was priceless – priceless in at least the amount of money Repole saw slip away in stud fees. Jack Wolf and Don Luccarelli of Starlight Partners arrived early in network TV wardrobe. They weren’t certain that Hilda’s Passion could withstand the pressure of Tar Heel Mom and the closing kick of Sassy Image in the gr. 1 Ballerina. Neither option proved a worry. Tar Heel Mom blew the break. Sassy Image blew the turn. Laurie Wolf, Jack’s wife, upstaged everyone in a tight-fitting orange sheer sheath and a glamorous statement hat. Javier Castellano rode the winners of two of the three grade 1 stakes plus the fourth and sixth races. Todd Pletcher missed being the trainer of the trio by a nostril. Repole had envisioned having his photo in the winner’s circle taken on four different occasions. He faced the camera only once. Attendance and handle were down, understandably. New Yorkers and New Englanders stayed away because of Hurricane Irene. 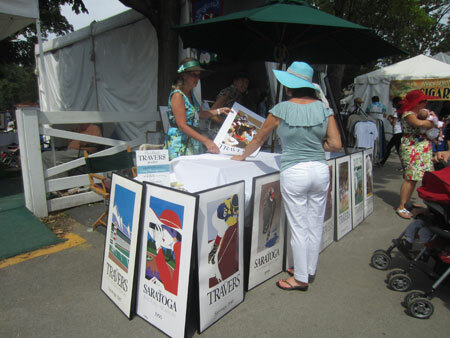 The antics of a self-described “fun group” of young men and women from Saratoga Springs captivated the attention of fans in Section G. Greg Montgomery, the artist of 28 Travers posters, was on hand with a pop-up shop, as he always is. Caption: Greg Montgomery's Travers posters - longest continuing series of sporting art in the world - on sale at the racecourse. 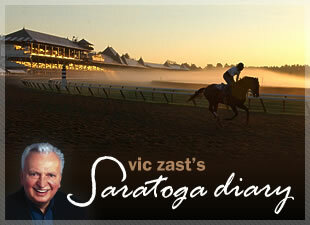 Vic Zast is the author of “The History and Art of 24 Travers.” He’s attended the races in Saratoga for 48 straight summers.